Are miraculous things still done through faith? Why does God not heal us from all of our infirmities, brokenness or disabilities? Why does life in the early Church, for people in the Bible, seem so different than our own? What does the Gospel actually do? Today’s selection from Acts contains the first healing miracle in the whole story. 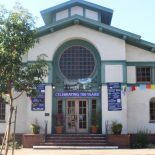 It’s situated just after the giving of the Spirit of God at Pentecost to the whole community of faith who then shared all things in common, praying together, worshipping side by side and living in radical material solidarity (we’ll work backwards to that episode for Pentecost Sunday : May 15). The disciples go about life and faith in a regular way. They don’t distance themselves from their larger community, or abandon their old way of related to God and to other people. Rather they are emboldened, informed and re-formed by their experience of the Gospel good news of Jesus Christ to expand their communal spirit of unity, solidarity and faith-full-ness to include those marginalized and rejected by the larger society. They have heard the teaching of Jesus: “‘Truly I tell you, just as you did it to one of the least of these who are members of my family, you did it to me.’” Matthew 25:31-46. They act accordingly. The disciples aren’t just passively and privately pious. Their prayer turns them outwards to confront the brokenness of the world – and themselves. As Peter and John go to pray at the Temple they see this crippled from birth man. They speak to him. And then in the name of Jesus this man defined only by his disability is raised up. The Greek word used for “to raise up” [egeiro] is used throughout the second Testament to also express the notion of being raised up from the dead: resurrected. This man is not just healed or made better. He’s (re)made into a new creation! How does that touch or interact with your live today? Or imagine yourself in the text. Who are you? The beggar? A disciple? Part of the crowd? An on-looker? How do you respond to the raising up of the unnamed man? How do you need God to raise you up from what cripples you in life? What invitation to act, speak, do or be do you hear through the Holy Spirit in the text? I usually think of the story as telling me to heal others, but today, I think about being the beggar, the one who was born with weaknesses and disabilities from birth, and whose helplessness is what is on display for all to see. And Peter says to him, become whole; your wholeness is from God. And your wholeness is not just for you, it’s for others who are touched by your story. It’s not about why we can’t do anything because of our weakness; it’s about being empowered to be whole, and to share it with others. This entry was posted on April 4, 2016 by Monte McClain in Blogging Towards Sunday.